In this post I map some attribute data using the R software package GGPLOT2. The code primarily comes from James Cheshire excellent GIS site, Spatial Analysis. This site offers many resources, including a number of step-by-step tutorials on introductory and advanced GIS mapping in R. A couple tutorials I found useful describe how to map attribute data in R. His code is concise and well written, but doesn’t explicitly describe how to map observations made on a continuous attribute variable at discrete levels. This is something standard with ArcGIS software and probably something people want to do, or, at least, are use to doing. Think of this code as a mix between Cheshire’s posts Creating a Map with R and Creating a map with R using ggplot2. 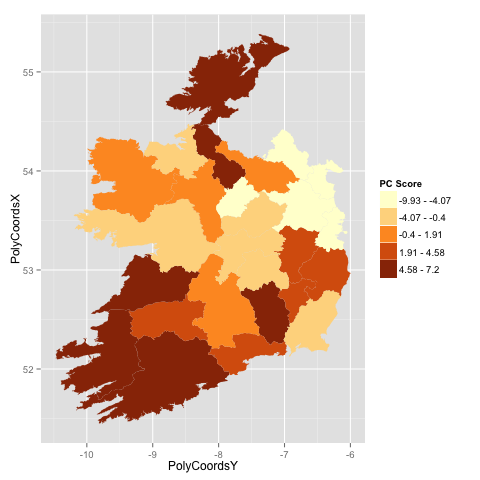 In the following code I essentially take the observed values on continuous attribute variable, break them into intervals and plot them on a map of Irish Republic counties. The continuous variable used here was broken into five categories, though the code is modifiable enough to accommodate different numbers of break points. You’ll need to use the R packages maptools, ggplot2, RColorBrewer and classInt the for this one.